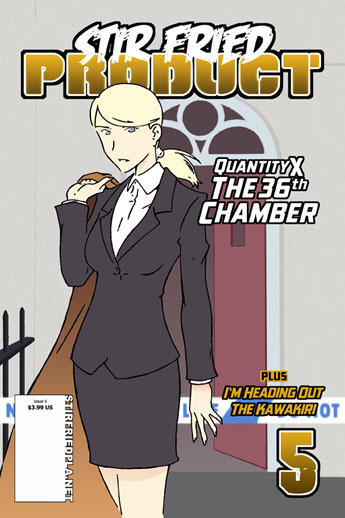 The fifth issue opens with Quantity X: The 36th Chamber Part I Detective Constable Hildebrandt of the London Metropolitan Police finds herself investigating a case dealing with unexplained phenomena. I'm Heading Out was an entry in the Embassy of Japan in the UKs MANGA JIMAN competition. The theme this time was 'nami' or 'wave' so this story takes its influence from Terence Nonweiller's waverider design concept. The Kawakiri continues, this time focusing on a minor character who appeared briefly the first chapter.